In Heroes, Arthur Petrelli was only defeated when the Haitan used his power to null Arthur's powers. Taking away everything and his healing. Spawn couldnt do that guys. Arthur wins. Pinehearst had many other villains in it that worked for Arthur. Wouldnt they help him against Spawn like the other Kryptonians would help General Zod on his ship? Did they willfully work for Arthur or did he force them to? The other prisoners could want Petrelli dead as much as Spawn. Wait, what am I talking about? Spawn is way too powerful to be held back by an old man's telekinesis. His Satan-gifted Exo-'skin armor' is too durable to be sliced open with telekinesis. Spawn is too fast and formidable to be even held at bay by Arthur Petrelli. It is Arthur who is out-matched and out-gunned in this battle, even if the other prisoners are on Petrelli's side. Spawn will kill them all. They did have a speedster in Heroes ya know. Arthur could slow down time and catch her. Why couldn't he do that with Spawn? Wasn't Sylar at Pinehearst too? And the others were there for many reasons, some out of fear and some because they were true villains and aligned themselves with Arthur. Still not seeing any argument that makes me think that the old man could take out Spawn. I see where people are coming from with how Arthur Petrelli could win, but its a stretch. I see Spawn taking this. Petrelli has the home field and powers advantage. But he would have to figure out how to keep Spawn down for good. I don't see this happening. Spawn has too many "guns in his arsenal". First "away" win of the season? We'll see. Did you folks even read this? No chance for Spawn. Read up on Spawn before you assume. The source of Spawn’s power comes from necroplasm. It is the necroplasm which gives him his strength and durability. His strength is capable of lifting an entire building and throwing it with ease. Necroplasm was originally dubbed by humans as Psychoplasm, but later in translation has become the green goo we're all more familiar with. Each Hellspawn is given 9:9:9:9 units of necroplasm and when that is gone they go straight back to Hell. Spawn’s main weapon however is his symbiotic suit. His suit is called Leetha of the 7th House of K or K7-Leetha. Spawn also has unique powers that other Hellspawn do not have. He can detect when someone is in danger or has been killed and he can feel negative emotions such as pain, hatred and misery. It was recently revealed that Spawn’s body contained a number of lost souls. Twitch Williams estimated that their may have been near 6,000 souls in his body. He was able to summon those souls as Hellspawn anytime he needed thanks to the help from a young Hellspawn named Christopher who escaped thanks to his heart being removed early in a battle. However these souls have currently moved on, but Spawn still has their knowledge and experiences. He later shows that a few souls still remained and were the most powerful of the group but these were truly finished off by Spawn's daughter Morana. 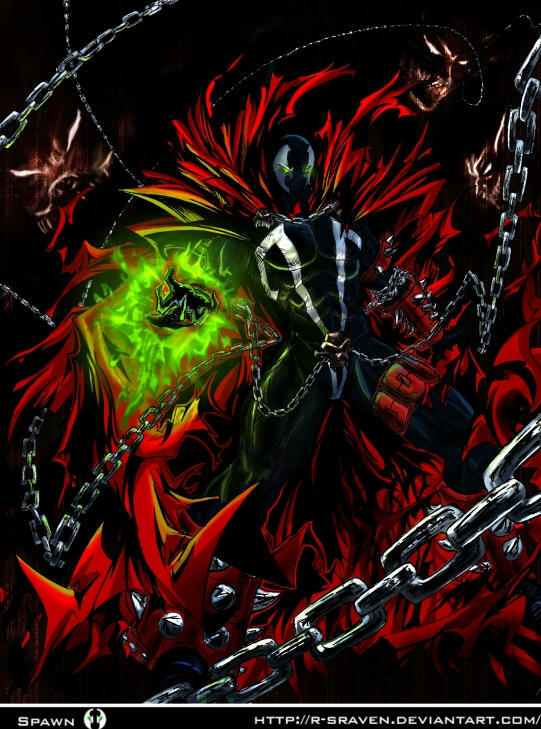 Spawn is often known as the one because of his abilities another common reason is because spawn was brought to hell and was leader at one point and would give all other Hellspawns orders to defeat their rivals, but Spawn found out that they were evil and then decided that he wanted to leave hell and continue his mission to conquer the world. The ruler was Violator a foe of Spawn and had to fight him in order for him to leave, this was the second battle they fought but didn't last long since Spawn had fought him and learned Violator's weaknesses and used them to his advantage. Spawn won the battle then was allowed to leave. Spawn returned to earth very fast due to his speed and teleportation skills after this battle Spawn learned that he had the power to travel to different dimensions. Spawn has become significantly stronger since I last followed him.